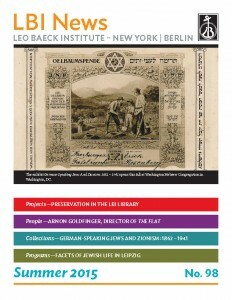 Nearly 8,000 records from the LBI catalog are now discoverable through Judaica Europeana, a catalog aggregator which brings together the digitized collections of institutions from Israel, Europe, and the United States. Judaica Europeana is one of dozens of topic-specific portals in an EU-Funded project that links digital collections from libraries, archives, and museums related to European cultural heritage. The LBI Archives have contributed memoirs, fully digitized archival collections, manuscripts, and genealogical tables. Additionally, the LBI Library has added rare books, illustrated books, and periodicals. Three other portals will also soon include links to LBI’s holdings. Deutsche Digitale Bibliothek aims to offer unrestricted access to Germany’s history and culture through the digitization of books, images, and other documents. Worldcat, the world’s largest aggregator of catalog holdings which unites about 72,000 libraries worldwide, already features bibliographic records for both digitized and non-digitized materials at LBI. Digital Public Library of America will also soon provide access to digitized periodicals at LBI in a pilot project currently underway.